Citrus tristeza virus (CTV), a member of the genus Closterovirus within the family Closteroviridae, is the causal agent of citrus tristeza disease. Previous studies revealed that the negative selection, RNA recombination and gene flow were the most important forces that drove CTV evolution. However, the CTV codon usage was not studied and thus its role in CTV evolution remains unknown. A detailed comparative analysis of CTV codon usage pattern was done in this study. Results of the study show that although in general CTV does not have a high degree of codon usage bias, the codon usage of CTV has a high level of resemblance to its host codon usage. In addition, our data indicate that the codon usage resemblance is only observed for the woody plant-infecting closteroviruses but not the closteroviruses infecting the herbaceous host plants, suggesting the existence of different virus-host interactions between the herbaceous plant-infecting and woody plant-infecting closteroviruses. Based on the results, we suggest that in addition to RNA recombination, negative selection and gene flow, host plant codon usage selection can also affect CTV evolution. Protein synthesis takes place when genetic codes stored in the genome is translated at ribosomes in a three-nucleotide manner from the 5' to the 3' end. Each three-nucleotides represents a unique genetic codon for an amino acid or as a translation stop codon. There are 64 codons for the 20 standard amino acids and three stop codons, resulting in more than one codon for most of the 20 amino acids. Codons encode the same amino acid are known as synonymous codons. The synonymous codons are not used in the same frequency in different genes or organisms, indicating the existence of biases in codon usage . Bias in codon usage may play an important role in evolution history of genes or organisms . It was reported that the codon usage bias can be influenced by many factors including translation selection, mutation pressure, gene transfer, amino acid conservation, RNA stability, hypersaline adaption and growth conditions [3–5]. Among these factors, mutation pressure and translation selection were thought to be the key factors shaping the codon usage bias . Viruses are obligate intracellular parasites which dependent on host cells for their genome replication and protein synthesis. It was reported that viral codon usage bias is determined by both virus itself and its host. Similar to other organisms, both mutation pressure and translation selection play a key role in shaping viral codon usage bias [7–10]. Other factors that affect viral codon usage bias include fine-tuning translation kinetic selection [11, 12], codon pair bias , and escape from cellular antiviral responses through a mechanism involving reduction of CpG dinucleotide . Studies of viral codon usage bias can improve our knowledge not only on virus evolution but also specific interactions between a virus and its host. The codon usage pattern of animal viruses, including human immunodeficiency virus type 1 and hepatitis A virus, has been studied extensively [11, 15–19]. For plant viruses this type of study is still rare [8, 20, 21]. Citrus tristeza virus (CTV), the causal agent of citrus tristeza disease, is a notorious plant RNA virus. CTV causes tremendous economic losses to the citrus industries worldwide . CTV is a non-enveloped, single-stranded positive-sense RNA virus belonging to the genus Closterovirus in the family of Closteroviridae. Genome RNA (gRNA) of CTV is approximately 19.3 kb in length and contains 12 open reading frames (ORFs) that from the 5' to the 3' end are ORF1a ORF1b p33 p6 p65 p61 p27 (encodes the minor coat protein), p25 (encodes the major coat protein), p18 p13 p20, and p23. The 12 ORFs are finally translated into at least 19 different proteins . ORF1a and ORF1b are translated directly from the gRNA and encode proteins that are required for CTV replication. The ORFs, present on 3′-coterminal subgenomic RNAs, encode proteins that are necessary for CTV replication (e.g. p65 and p61), virion assembly (p65, p61, p27 and p25) , virus movement (p65, p61, p6, p20) , symptom development and asymmetrical accumulation of positive and negative strand viral RNAs during CTV infection (p23) [27–29], and suppression of RNA silencing (p25, p20 and p23) . Functions of CTV p33, p18 and p13 proteins have not been determined. Isolates of CTV can cause different disease symptoms (i.e. yellowing canopies, declining and stunting of trees, and stem pitting) on different indicator citrus plants, indicating the existence of a highly diversified genetic population of CTV in nature . Previous phylogenetic and genetic marker analyses showed that CTV is consists of several genetically distinct genotypes [32, 33]. Previous studies also showed that RNA recombination, negative selection and gene flow are the important forces that drive evolution of CTV [34–38]. However, the contribution of codon usage bias to CTV evolution remains unclear. In this study, a detailed comparative analysis was performed using the coding regions for all CTV proteins (refer to full coding region thereafter) to determine the CTV codon usage pattern. Our results show that CTV has a high level of codon usage resemblance to its citrus host, suggesting that codon usage adaptation may also have an important role during CTV evolution. The effective number of codons (NC) of the 20 selected CTV isolates was determined to generate an overall view of the codon usage patterns. Table 1 shows that the NC values of the 20 selected CTV isolates varied from 51.9 to 54.8, with an average value of 53.0 ± 0.6641. This fining suggests that CTV does not possess an excessive overall codon usage bias and the variation of codon usage bias among CTV isolates is small. The nucleotide abundance was then calculated as another indicator of codon usage bias for CTV (Table 1). The overall Guanine and Cytimidine (G + C) contents in the CTV full coding region and at the synonymous sites (G + C)3 fluctuate ranging from 41.4 to 42.2% with an average at 41.8 ± 0.21 and from 41.5 to 43.8% with an average at 43.0 ± 0.68, respectively (Table 1). These results indicate that variation of (G + C) content among CTV isolates in the full coding region and at synonymous sites is small. Comparing the A, U, G and C contents at the synonymous sites (abbreviated as A3, U3, G3 and C3), it is clear that the U3 value is the highest, ranging from 35.9 to 37.1% with an average at 36.5 ± 0.36. Thus the major codons used by CTV are U-ended. Further comparison of the U, C, G and A contents with the U3 C3, G3, and A3 contents indicated that the U and C contents were significantly enriched at the synonymous sites, whereas the G and A were significantly decreased at these synonymous sites (t test, P < 0.001). To generate a visual display of the main features of codon usage pattern as reported previously by Wright , we performed the NC-plot, a plot showing NCvs. (G + C)3. In this NC-plot (Figure 1), all the CTV isolates clustered together and deviated slightly from the expected curve, which represents the expected codon usage when G + C compositional constraints alone account for the codon usage bias . Our finding implies that CTV is subjected to G + C compositional constraints. N C -plot of N C values versus (G + C) 3 contents of CTV isolates. Blue curve indicates the expected curve when all codons are used randomly (no selection) and is calculated using the formula reported by Wright previously . To further confirm this conclusion, we analyzed the cumulative relative synonymous codon usage (RSCU) values for the 20 selected CTV isolates with a total number of 123,535 synonymous codons (Table 2). For amino acids (except Leu) that have more than two synonymous codons (e.g. Val, Ser, Pro, Thr, Gly, Arg, Ala and Ile), the codons with the highest RSCU values are all ended with U. For amino acids that have two synonymous codons and are ended with U or C (e.g. Phe, His, Asn, Asp, Cys and Tyr), only Tyr displayed a weak preference to codons ended with C (UAC). The RSCU values for amino acids that have two synonymous codons and are ended with A or G (e.g. Gln, Lys and Glu) are similar, indicating that a similar codon usage frequency (Table 2). These results demonstrate that CTV likely prefers a U-ended codon usage. aAA is the abbreviation of amino acid. bN, the total numbers for each codon used by the 20 CTV isolates. cCTV, the mean RSCU values of CTV. dCS, the mean RSCU values of Citrus sinensis. eThe Preferred codons are under lined. A preferred codon is defined by the codon with the highest RSCU value among all available synonymous codons for a certain amino acid. However a codon with the highest RSCU value but lower than 1.1 cannot be defined as the preferred codon, since this value is statistically insignificantly under 95% confidence interval. To compare the codon usage patterns of CTV and its host, we downloaded the codon usage pattern of C. sinensis from the Codon Usage Database (http://www.kazusa.or.jp/codon/). Interestingly, our analysis shows that most of the C. sinensis preferred codons are also U-ended (Table 2). We then calculated the codon nucleotide abundance for C. sinensis and compared it with that of CTV. It was reported previously that for synonymous codons, the second nucleotide site has the strongest constraint, followed by the first nucleotide site . As shown in Figure 2A, CTV has a almost identical nucleotide abundance at the second nucleotide site compared with that of C. sinensis. At the first nucleotide site, a similar trend is also evident with slight variations between the two species. At the third nucleotide site, however, both CTV and C. sinensis showed a high content of U, indicating that U is preferred by both CTV and C. sinensis at the synonymous sites. Interestingly, the second abundant nucleotide at the synonymous sites for C. sinensis is C, which is found to be over-represented at the CTV synonymous sites (Table 1). 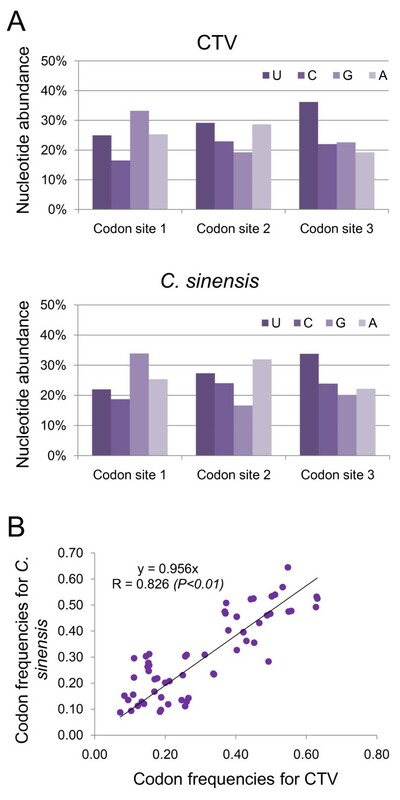 Furthermore, the observed codon usage frequencies for CTV is highly correlated with that for C. sinensis (R = 0.826, P < 0.01) (Figure 2B), indicating that the codon usage of CTV has a high level of resemblance to that of C. sinensis. Comparative analysis of nucleotide composition and codon abundance of CTV and C. sinensis . (A) Frequencies of 4 nucleotides at the three positions within a codon for the full CTV coding region (up panel) and coding region of C. sinensis (lower panel). (B) Correlation of the codon abundances between CTV and C. sinensis. CTV is known to have several distinct biological genotypes [31–33]. To determine the codon usage variations for these CTV genotypes, a phylogenetic tree was constructed using the full coding region of CTV. Similar to the phylogenetic tree constructed using the CTV full length genomic sequences , the yellowing and stem pitting isolates were clustered in the same group (group1), the quick declining isolates were clustered in the group2, and isolates that are capable of breaking CTV resistance in trifoliate orange (Poncirus trifoliata) were clustered in the group3 (Figure 3A). To determine the variation of codon usage among the CTV genotypes we conducted a correspondence analysis (COA), a method used to detect major trends in codon usage variations between genes or organisms , based on the RSCU values from the 20 selected CTV isolates. Results of the COA extract two major axes. The Axis 1 can explain 37.98% and the Axis 2 can account for 17.18% of the total variations observed. A plot of the two major axes was shown in Figure 3B. In the plot, the three phylogenetic distinct groups are clustered in three independent fields, indicating that these three CTV groups have different trends in codon usage. Codon usage variations of CTV genotypes. (A) NJ phylogenetic tree of CTV constructed using the entire coding region. The yellowing and stem-pitting CTV group is colored in blue, the trifoliate orange resistance breaking CTV group is colored in purple, and the quick declining CTV group is colored in yellow. (B) Distributions of CTV codon usage variation along the first and second axes based on the COA analysis. Coordinates of the three CTV groups are colored in the same way as that shown in Figure 3A. A correlation analysis was performed using the nucleotide compositions at the synonymous sites and the two major axes obtained from the COA analysis (Table 3). This analysis allows us to identify the contents that are responsible for the variations [19, 42]. Results of the analysis show that only C3 has a clear correlation with the two major axes. This indicates that although U is the most preferred nucleotide at the synonymous sites the codon usage variations found among the CTV genotypes were determined by the content of C at the synonymous sites. The high degree of CTV codon usage adaptation to its host suggests that the adaptation may be a common phenomenon between closteroviruses and their hosts. To confirm this hypothesis, the full length genome sequences of beet yellows virus (AF056575, BYV), carrot yellow leaf virus (NC_013007, CYLV), grapevine rootstock stem lesion associated virus (NC_004724, GRSLaV) and grapevine leafroll-associated virus 2 (NC_007448, GRSLaV-2) were downloaded from the GenBank. 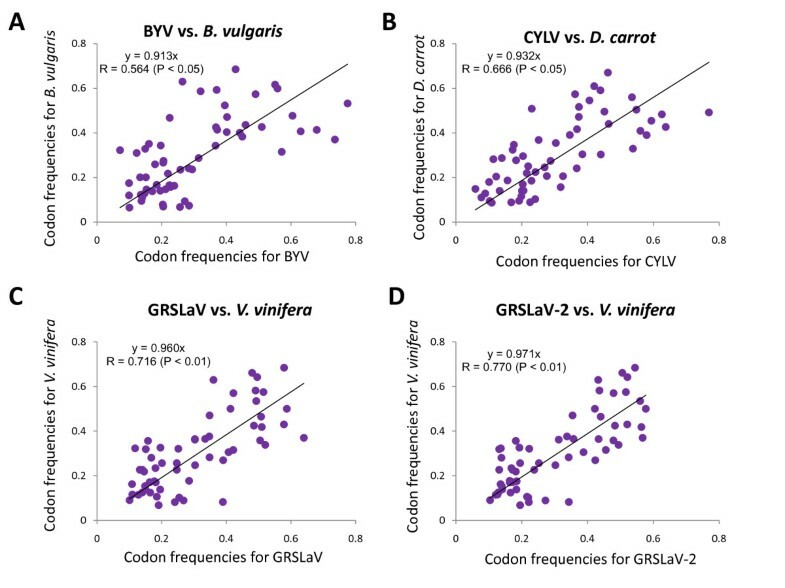 The empirical codon frequency of each virus was calculated and compared with that of its host plant: Beta vulgaris (beet) for BYV, Daucus carrot (carrot) for CYLV, and Vitis vinifera (grapevine) for GRSLaV and GRSLaV-2. Results shown in Figure 4 indicate that significant correlation (P < 0.01) is observed between grapevine and its two viruses (GRSLaV and GRSLaV-2) but not between beet and BYV or carrot and CYLV. This finding shows that codon usage adaptation to a host is not a common phenomenon of closteroviruses. It occurs only in some closteroviruses. Correlations of the codon abundances of closteroviruses and their respective host species. (A) Beet yellows virus (BYV) versus Beta vulgaris (beet); (B) Carrot yellow leaf virus (CYLV) versus Daucus carrot (carrot); (C) Grapevine rootstock stem lesion associated virus (GRSLaV) versus Vitis vinifera (grapevine); (D) Grapevine leafroll-associated virus 2 (GRLaV-2) versus V. vinifera. The codon usage patterns of beet, carrot and grapevine were downloaded from the Codon Usage Database (http://www.kazusa.or.jp/codon/). In this study, a detailed comparative analysis was done to determine CTV codon usage bias. Our results show that in general CTV does not have a high degree of codon usage bias (average NC = 53.0, Table 1), and mutational bias is likely to be the major force that drives CTV codon usage bias (Figure 1). This finding supports the previous reports that mutational bias is the major force that affects the viral codon usage in other viruses [7, 8]. However, the deviation of the coordinates from the expected curve shown in the NC-plot cannot be simply explained by the mutational bias as suggested by Wright previously . It is possible that this deviation is caused by either the G/C-biased mutation pressure or the negative/positive selection of codons ended with C and/or G as described before . In deed, comparing the A, U, G, and C contents in the full coding region with that found at the synonymous codon sites, C is over-represented at the synonymous codon sites in addition to U (Table 1). Interestingly, analysis of selective pressure that act on different codons suggested that the full coding region of CTV is subjected mostly to the purifying selection described by Martin et al. . It is possible that the enrichment of C at the synonymous sites is caused by negative selection other than the C biased mutational pressure. Furthermore, results of COA show that the C content at the synonymous sites is the major factor that determines the codon usage variation among the CTV genotypes (Table 3). Because different CTV genotypes were reported to have different host origins , the enrichment of C at the synonymous sites is likely caused by the selection of the host. Our results also show that codon usage of CTV has a high level of resemblance to that of its citrus host. This is because i) both CTV and citrus have significantly higher content of U at the synonymous codon sites; ii) most of the preferred codons in CTV and citrus are the same; iii) a high correlation exists in codon frequencies between CTV and citrus. This result is understandable when consider the specific relationship between CTV and its host. CTV is restricted to citrus and it is generally accepted that the virus co-evolved with the host species . Whereas, citrus is a woody plant and can grow in field for hundreds of years . After successful infection, the virus can survive in this host for a very long period of time. This long term infection gives CTV an opportunity to select and adapt optional codons generated during virus replication. As discussed above, the C3 content is the major factor that determines the codon usage variation among the CTV genotypes. Our data also indicate that the degrees of codon usage adaptations by different CTV genotypes to C. sinensis are different, suggesting that the codon usage variation may reflect specific interactions between the CTV genotypes and their original hosts. Because detailed genetic information on CTV original citrus hosts are missing, we are unable confirm the codon usage adaptation by CTV genotypes to their respective hosts. 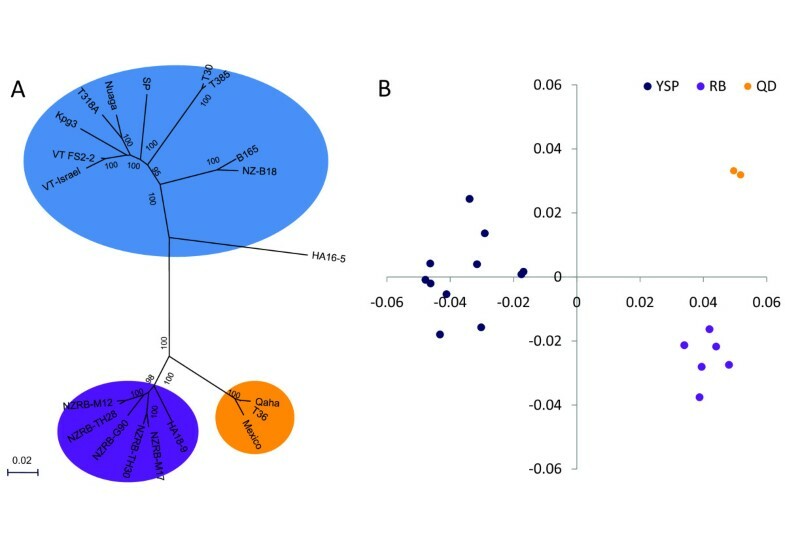 Nevertheless, our results presented in this paper show that CTV and citrus is an idea model for studies of virus and host coevolution. Bahir et al. suggested previously that adaptation of codon usage varied among different viral genes and the highest degree of adaptation was observed for genes that expressed to high levels in cells, such as the viral CP . In this study we also tried to analysis the variations of codon usage among CTV genes, and the different host effects on these genes. However, this attempt was un-succeeded because the number of codons used by some CTV genes are limited and thus many synonymous codons may not be observed. This may cause artificial errors when compare virus codon usage frequency with that of its host. High adaptation of codon usage was previously reported for several viruses including those belonging to the family Flaviviridae, and bacteria-infecting and human viruses [14, 21]. We proposed that high codon adaptation phenomenon might exist in all viruses in the genus Closterovirus since the codon usage patterns of different closteroviruses are highly resemblance to each other (data not shown). However, our results show that the high degree of codon resemblance is only observed between the woody plant-infecting closteroviruses and their woody hosts, but not the herbaceous plants-infecting closteroviruses and their herbaceous hosts (Figure 4). This difference may be caused partially by the different longevity of closteroviruses in their infected herbaceous or woody plants. It is known that the woody plant-infecting closteroviruses can exist in their host plants for a very long period of time. In addition, all woody plant-infecting closteroviruses infect only a few closely related species within the same genus. This narrow host range feature may also have a role in this unusual high codon adaptation phenomenon. For example, the natural hosts of CTV are limited only to a few species within the genus of Citrus. A detailed comparative analysis of CTV codon usage pattern was performed in this study. Results of the study show that the overall codon usage of CTV is highly resemble that of its host, C. sinensis. Our results also show that the codon usage resemblance is only observed for the woody plant-infecting closteroviruses but not the closteroviruses infecting the herbaceous host plants. This observation implies the existence of different virus-host interactions between the herbaceous plant-infecting and woody plant-infecting closteroviruses. In conclusion, our results indicate that in addition to RNA recombination, negative selection and gene flow, host codon usage selection can also have an important role in CTV evolution. Full length genome sequences of CTV, BYV, CYLV, GRSLaV, and GRSLaV-2 were downloaded from the GenBank (http://www.ncbi.nlm.nih.gov/). 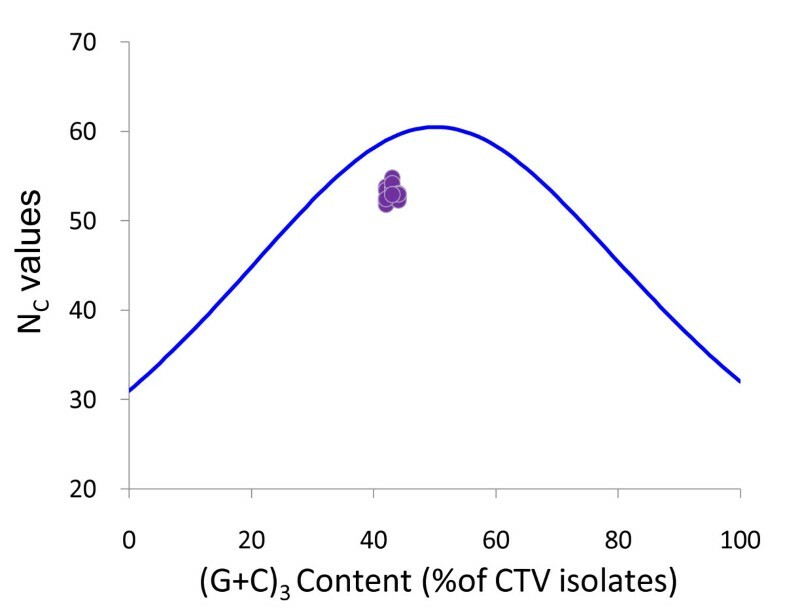 To establish a sequence data set for CTV, isolates share less than 98% sequence identity were downloaded and the final data set consists of 20 CTV isolates (Table 4). The accession numbers and other information on these isolates are listed in Table 4. For codon usage analysis open reading frames (ORFs) with less than 150 nucleotides were excluded as described before . bYSP, yellowing and stem pitting. The codon usage pattern of C. sinensis B. vulgaris D. carrot, and V. vinifera were downloaded from the Condon Usage Database (http://www.kazusa.or.jp/codon/), which were tabulated based on all available sequences in the international DNA sequence databases . Phylogenetic tree was constructed using the Neighbor-joining (NJ) method described in the MEGA 5.0 software . The nucleotide substitution model, mutation rate and mutation pattern were determined using the Model Selection Function described also in the MEGA 5.0 software. The Bootstrapped confidence interval is based on 1000 replicates. Analysis of compositional properties of all CTV ORFs, including (G + C), (G + C)3, A3, U3, G3 and C3, was performed using the CodonW version 1.4.2 (John Peden, available at http://codonw.sourceforge.net/index.html). The nucleotide contents at the first and second codon positions were calculated as described by Wang et al. previously . Effective number of codons (NC) has been used as a measurement for synonymous codon usage bias in genes and is considered to be independent of the gene length and amino acid composition . The NC value ranging from 20 to 61 is often used to determine the degree of codon usage bias in a gene . For example, a gene with a NC value at or below 35 is considered to have a strong codon usage bias, whereas a gene with a NC value of 61 indicates that all available codons are used equally . In this study the NC values were calculated using the CodonW version 1.4.2. RSCU value is the ratio of observed to expected frequency of a codon and reflects the bias of synonymous codon usage without the influence of amino acid composition and the abundance of synonymous codons . A RSCU value above 1.0 indicates a positive codon usage bias, a value below 1.0 implies a negative codon usage bias, and a value at 1.0 indicates no codon usage bias for the synonymous codons . In this study the RSCU value is calculated using the General Codon Usage Analysis (GCUA) software available at http://bioinf.may.ie/GCUA/calculatecodon.html. COA is a commonly used multivariate statistical analysis method  and has been used to investigate the major trends in codon usage variation between genes or organisms [19, 41, 42]. In this study, COA is used to analyze codon usage variations between CTV isolates. In the analysis, the RSCU values of synonymous codons (excluding Met, Trp and the three termination codons) were treated as 59 dimensional vectors. Therefore, each CTV isolate can be represented by a 59 coordinates (RSCU values). The calculation was done using the CodonW 1.4.2 software. Correlation analysis was performed to determine the relationship between nucleotide composition and synonymous codon usage pattern using the Spearman’s rank correlation analysis described in the SPSS 16.0 software (SPSS Lnc., USA). This study was supported by the Scientific Research Foundation of Hangzhou Normal University (Project No: 2351001020) and the Natural Science Foundation of Zhejiang Province (Project No: Y3110175 and Y3110277). We are grateful to Dr. Xin-shun Ding (The Samuel Roberts Noble foundation) for his helpful modifications and suggestions to the manuscript. XC involved in data calculation, results analysis and manuscript preparation; XW involved in data collection, results analysis and manuscript revision; HW and YS involved in data analysis and manuscript preparation; YQ and LL involved in data visualization; All authors have read and approved the final submission of the manuscript.